Expression of HLAE in tumors and its relation with KLRC1 (NKG2A) expression. (A) Expression of HLAE in 10,375 specimens from 33 tumor types; box plots with data from every sample superimposed show log10 HLAE gene transcripts per kilobase million (TPM) in adrenocortical carcinoma (ACC), BLCA, BRCA, CESC, cholangiocarcinoma (CHOL), COAD, diffuse large B cell lymphoma (DLBC), esophageal carcinoma (ESCA), GBM, HNSC, kidney chromophobe (KICH), KIRC, kidney renal papillary cell carcinoma (KIRP), AML, LGG, liver hepatocellular carcinoma (LIHC), LUAD, LUSC, mesothelioma (MESO), ovarian serous cystadenocarcinoma (OV), pancreatic adenocarcinoma (PAAD), PCPG, PRAD, READ, SARC, SKCM, STAD, testicular germ cell tumors (TGCT), THCA, THYM, uterine corpus endometrial carcinoma (UCEC), uterine carcinosarcoma (UCS), uveal melanoma (UVM). Box boundaries, first and third quartile range; whisker, interquartile range (first quartile to third quartile range) ×1.5. (B) Shown is log2 normalized expression of HLAE with KLRC1, KLRD1 (CD94), or KLRC2 (NKG2C) in 9520 tumors analyzed (tumors lacking KLRC1 expression were excluded). Pearson’s correlation coefficient and linear regression line are shown. (C) Relation between log2 normalized expression of HLAE and KLRC1. The 9520 tumor specimens were ordered by expression of HLAE or KLRC1; the corresponding expression of KLRC1 and HLAE is shown. 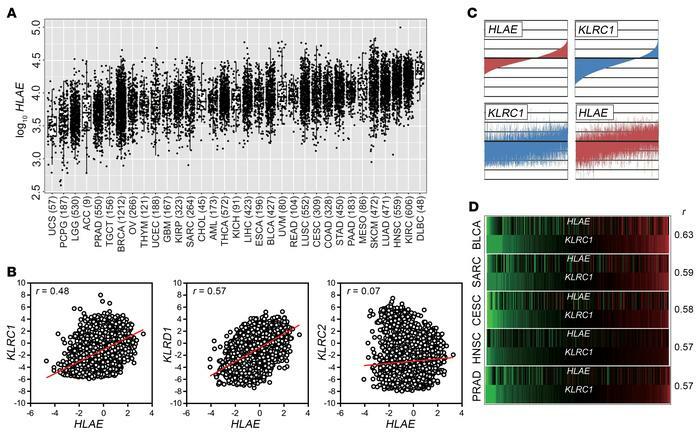 (D) Relation between HLAE and KLRC1 expression in tumors with high Pearson’s correlation coefficient.